Once a month Wichita-area payroll professionals get together for a delicious lunch buffet at the Petroleum Club, centrally located in downtown Wichita. We spotlight a different speaker each month. 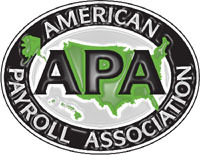 Speaker topics are approved by the National APA and can be used toward 1 hr of continuing education credit. Each meeting is from 11:30 am to 1:00 pm. The cost of each meeting is currently $16.00 for members and $20.00 for non-members. Payment is due at the meetings. Approximately one week prior to each meeting, invitation reminders are sent out by email. Recipients must respond if they are attending so a head count can be turned in to The Petroleum Club. We meet the second Thursday of the month and recess during December and January.